Louise Lyson Bulgheroni was born on 18 January 1896 in Monaco. She married Otto Marquard Forster, son of Conrad August Forster and Minnie Lorey, on 26 April 1919 in Marie de Monaco, Monaco, Principality of Monaco. Lyson Forster applied for a passport in New York, New York, on 27 May 1921, to be accompanied by her minor daughter Elynor, for the purpose of visiting relatives in France, Switzerland, Italy & Gibralter, leaving New York on 4 June 1921 aboard the SS Mongolia. Passport was issued 1 June 1921. 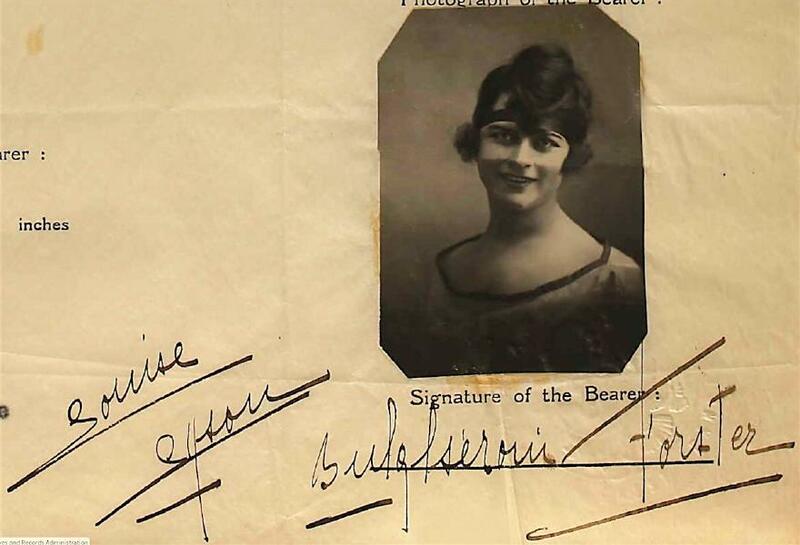 Louise Lyson Bulgheroni and Elynor Forster arrived in the Port of New York on 17 October 1921, aboard the SS Berengaria, having depared Cherbourg, France on the 11th, address in St. Louis, Missouri, 4935 McPherson Avenue. The following appeared on 1 October 1922 in The St. Louis Star: Mrs. Minnie Forster of 4933 McPherson avenue has as her guest her daughter-in-law, Mrs. Otto M. Forster, and her baby daughter. Mrs. Otto Forster was formerly Mlle. Lyson Boulgheroni of Monte Carlo. She met Lieut. Commander Forster during his service overseas in the late war. The visitors will remain two months. Louise Lyson Bulgheroni arrived in the Port of New York on 26 April 1926, accompanied by Elynor Forster and Lyson Muriel Forster aboard the SS Leviathan, having departed Cherbourg, France, on the 20th. Washington, DC, address 3812 Warren Street. Louise Lyson Bulgheroni arrived in the Port of New York on 8 July 1927, accompanied by Elynor Forster and Lyson Muriel Forster aboard the SS George Washington, having departed Cherbourg, France, on 30 June. Washington, DC, address 3812 Warren Street. Lyane Bulgheroni arrived on 12 April 1929 in the Port of New York aboard the SS De Grasse, having departed Le Havre, France, on the 3rd, intending to spend about four months with her sister Mrs. Forster at 612 Argyle Road, Brooklyn, New York. Louise Lyson Bulgheroni arrived in the Port of New York on 19 May 1934, aboard the SS President Taft, having departed Havana, Cuba, on the 16th. Address c/o Naval War College, Newport, Rhode Island. Louise Lyson Bulgheroni arrived in the Port of New York on 18 April 1935, aboard the SS Roma, having departed Naples, Italy, on the 8th. Newport, Rhode Island, address 4 Hunter Avenue. Francesco Bulgheroni arrived in the Port of New York on 8 October 1936, accompanied by Louise Lyson Bulgheroni aboard the SS Conte Di Savoia, having departed Genoa on 30 Sept., his visa issued at Nice on the 2nd, to visit his daughter Mrs. O. M. Forster at Quantico Marine Barracks. Louise Lyson Bulgheroni arrived in the Port of New York on 20 April 1939, aboard the SS Rex, having departed Cannes, France, on the 13th. Address in Long Beach, California, 34 First Place. Lyane Marina Bulgheroni arrived on 12 April 1929 in the Port of New York aboard the SS Champlain, having departed St. Naziare, France, on 30t March, intending to spend about six months with her sister Mrs. O. M. Forster at 4505 33rd Street, Seattle, Washington. Louise Lyson Bulgheroni arrived in San Pedro, California, on 23 October 1941, aboard the "Honolulu Clipper," having departed Honolulu on the 22nd. Louise Lyson Bulgheroni arrived in New York City on 18 December 1949, aboard Pan American Airways Flight 143 from Nice, France. Residence in California. Louise Lyson Bulgheroni became a widow at the 31 December 1961 death of her husband Otto Marquard Forster. Louise Lyson Bulgheroni died on 28 May 1985 at age 89 in San Diego County, California.